Born on June 27, 1945 in Aynor, South Carolina, David Scott earned a BA from Florida A&M University in 1967 and an MBA from the Wharton School of Finance in 1969. He is the brother-in-law of baseball legend Hank Aaron. From 1985-93, Scott hosted the radio program Coors Inside Black America! He also spent a number of years as the owner and CEO of the Atlanta-based Dayn-Mark Advertising Agency, which specialized in creating, producing, and placing radio, television, and print ads. Scott launched a political career in 1974 when he began an eight-year stint as a Democrat in the Georgia State House of Representatives. 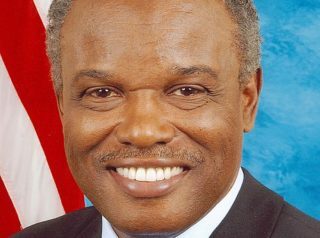 He then served in the Georgia State Senate from 1983-2002, and since 2003 he has represented Georgia’s 13th Congressional District in the U.S. House, where he is a member of the Congressional Black Caucus. Beginning in 1998, Scott’s agency, Dayn-Mark Advertising, failed to pay more than $4,600 that it owed in local and state taxes. In 2003 it began failing to make federal tax payments as well, and by 2007 it owed more than $150,000 in back taxes. During this same general time period, Scott and his wife failed to pay $23,200 in taxes on their home. As of 2007, there were more than 40 tax liens on Scott’s home and business. Notwithstanding all this, the Scotts’ stock holdings grew during these years from $5,000 to over $65,000, and they purchased a Washington, DC home worth more than $700,000. In July 2007, congressional staffer Robert Merrill alleged that Scott had illegally assigned him and other staff members to work on his (Scott’s) re-election campaign—often during government office hours, and frequently with the use of government equipment. On other occasions, said Merill, Scott had directed his staffers to perform this work from the offices of Dayn-Mark Advertising, again during official government hours. All such activities are in violation of federal laws that: (a) prohibit congressional representatives from soliciting political contributions (whether in the form of money, gifts, or services) from their staff, and (b) forbid the use of taxpayer dollars for campaigning purposes rather than official government business. As a result of all these matters, CREW in 2007 named Scott as one of the 18 most corrupt members of the House of Representatives. That same month, when the House of Representatives voted by a 345-75 margin to defund the notoriously corrupt community organization ACORN, Scott was one of the 75—all Democrats—who voted to continue funding the group. When the Daily Caller in February 2018 contacted Scott and a number of his fellow Congressional Black Caucus members to ask if they would be willing to publicly denounce the notorious Nation of Islam leader Louis Farrakhan, Scott was one of 20 who declined not only to denounce him, but also to issue any comment at all regarding his infamous anti-Semitic, anti-white rhetoric. For an overview of Scott’s voting record on a range of key issues during his years in Congress, click here. For additional information on David Scott, click here. Further Reading: “David Scott” (Votesmart.org, Legis.Ga.gov); CREW Complaint Against Rep. David Scott (CREW, 9-20-2007); “Congressman David Scott Condemns Republican Voter ID Bill” (9-20-2006); “Democratic Congressman: We Need Food Stamps Because So Many Fathers Are in jail” (Daily Caller, 2-25-2015); “Black Caucus Members Refuse to Denounce Hate Group Leader Louis Farrakhan” (Daily Caller, 2-7-2018).